Last week I wrote about Taco Tuesdays, which has proven to be a taco purveyors' boon. But if there's a day of the week that calls for better food bargains, it's Monday. Why? Monday is the slowest day of the week for restaurants. Rather than sitting out the night idly, some restaurants choose to be closed. Others, like Pizza Shack in Tustin, incentivize customers with unbeatable deals. Their discounted pie offer is so good, in fact, that it even bests Costco's pizza on value. 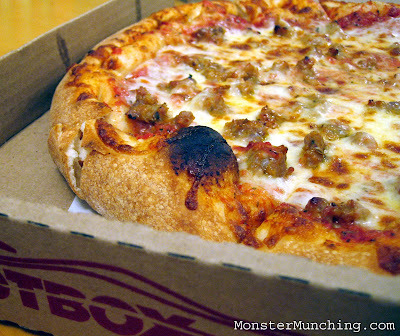 Pizza Shack's medium, one-topping pizza is $7.85 (tax included) on Mondays (5 P.M.-9 P.M., take-out only). No coupon is necessary, and it feeds three hungry mouths amply with four slices each. So yes, for almost every Monday since I found out about the special, I've been having pizza -- and it's a pretty satisfying one at that. Its dough is a yeasty, springy specimen with a toothsome pull and an edge crust that's good for sopping up the pepperoni grease. And if you do get the pepperoni as topping, there will be lots of it to soak up. The red, oily ooze seems to sweat out of the pepperoni like its been squeezed out by a vice. The grease will gloss the pie in a thin, rose-colored veneer. Inevitably, it'll dribble out the sides, slicking your lips and drenching your napkin. If the extra fat is not your cup-o-tea, get the sausage. It's got the same peppery overtones and porky underpinnings of the pepperoni, but is far leaner and not as sloppy. Added to that, in every other chewy morsel, there's that occasional burst of fennel that the pepperoni hasn't got. Some have also noted the sauce's inherent spicy kick. I attribute that to the pizzeria's Asian owners, Frank and Susan, who, by the way, are always in cheery mood eventhough it's Monday. Good Sunday evening to you, Elmomonster. Whilst I much prefer a thin crusted pie...my mouth is watering nonetheless! That pizza sounds absolutely divine! What more can you ask for? A cheap pie from a independent business owner who are really nice. Sound like the pizza tastes good too! I wonder if you can use the coupons on their website? Or are they there to show you what to look for in the mailers? Went to 85 degrees bakery on your recomendation and had the tuna Danish. It was soooooo good. The sweet pastry totally works with it! God that place was busy. They are making money hand over fist. The almond thing was OK. But the cream filled pastries were out of this world. They ran out of the calamari loaf. Also, have you noticed how everyone is doing a food blog now? Watching food shows lately and the hosts always pair up with some food blogger now. Start a food blog, Its the latest trend. Its almost passe now. That's why I love this food blog. You were doing before it was popular and have hung in there. Thanks. Hi Elmo - You gotta love these day of the week specials! And not from a chain to boot. Doesn't look like they do a white sauce. If they did I might give them a shot. I don't eat pizza with red sauce. But I could probably hurl a rock and hit the joint so maybe I'll order something for Steve. I've only tried the pizza places on Newport for him. I just got back from this place. I was 45 minutes early for the special as the review does not state its after 5 pm. I live up in the hills so its kinda far. I told them I read about them in Elmo's blog and was so looking forward to it. They still said no (and there were not a lot of customers). So I said "Never mind then"
If I owned a restaurant in these times, I would have taken a customer's money, even if he was 45 minutes early. Do they buy grain futures live or something and get a deliver of the "cheaper" dough at 5pm or something? Tonight (Monday) I had three. And I couldn't eat another bite! Whoa! That is cheap! You know what? I didn't do the math till you mentioned it. That's like cheaper than a Vietnamese sandwich. And I didn't think anything was cheaper than those...well, except maybe tacos. I, too, as you know, am of the crisp-thin-club, but this pizza is the exception -- plus, I can't pass up a bargain! Sorry. That was my fault, not theirs. I've modified the review to include the fine print and there's only the 5pm-9pm caveat and that it's take-out only. And yes, everyone should start a food blog, but if they want the hits, they need to start a cooking food blog. That's where the action is. Restaurant Review blogs like this have hit their audience level plateau. Yep. Pizza Hut has that 5 pizzas for 5 dollar thing, but I'll take the Shack over the Hut anyday. Well, Monday in particular. About 4 doors down from the pizza place, there's Pho Bac which still offers $3.99 pho or $4.99 chicken skewers with rice...though it's dine-in only. But then, you're a fabulous home cook! I bet you cook better things than this pizza! Pizza pretty much pleases everybody, doesn't it? I like mine with pineapple, black and green olives and anchovies. I know I'm weird, but I like the cheesy, salty, sweet goodness of it all. He he thanks. But I like takeout quite a bit, believe me. Especially lately since I can't even catch my breath. I've been to Pho Bac. Ehhhh. But hey, there aren't a lot of good pho options in Tustin. Yeah, I think Monday is a slow day. I usually talk to the ladies at Renu Nakorn about being slow on Monday. They told me that football killed them on that day. I know that my favorite fish taco place at Senor Baja started offering 99 cents fish tacos on Monday now because it's getting slower. Speaking of which, I noticed the discount only apply to take out only. Which I understand, but do they offer a delivery special to attract people? The pie sounds awesome and espcially the crust seemed to be good. Although I still in the in on that thin crust craze. Taco Tuesday, Pizza Monday. What's next? 50 cents burger on Thursday? Hope you can find that for us! You know, I've never ever had an anchovy pizza. And I really need to. I guess it has always seemed like a fifth-grade level dare or something. But I eat anchovies (the dried and crunchy kind) all the time in Indo food. I also eat the puffed up kind the Thai's make into chips. Yup. If only Trieu Chau or Quan Hop opened in Tustin...now we're talkin'. Or a better solution for me would be if I can figure out how to make pho without resorting to MSG! And oh yeah; though Pizza Shack delivers, I don't think the special applies for that. mmmm.. and do they have deep dish pizza?? is the sauce is ALWAYS spicy? I think they do have deep dish, but the sauce is just spicier than most, not too noticeably so. I like the price most of all! Pizza is an amazing food! I live in Costa Mesa and my favorite local pizza place is Hotties Pizza! the food there rocks! check out the menu and I hope you like it...I know you will! www.hottiespizza.com You can see the menu from their site. The overall theme of the names and pizza is great! The Plain Jane, The Girl Next Door, The Bachelorette, Prom Queen, Island Girl. And of course, The Call Girl. Elmo - I don't know what took me so long to write you a comment for the first time. Tonight after my wife and I finished almost an entire Italian Sausage Monday Night Special, I felt the urgency and responsibility to tell you how grateful I am to discover your blog two years ago! Man, all I can say is I am doing my Stater Bros. runs on Mondays for now on!! PS. I mentioned about your blog to the owner. He was pleasantly surprised and seemed rather excited when he jugged down Monster Munching. Thanks for delurking! I'm so happy you liked the pizza. I'm there almost every Monday. I skipped this week because I had too much leftover food from the weekend, but you can bet I'll be eating Pizza Shack next week! And I love that readers like you and Diamond Dog are mentioning this blog to them. I love it because it makes me sound famous or influential or something! I bet these restaurant owners are going "Monster what?" The Rucola Parma was nice and having the salad on top of the pizza is very refreshing as you get the contrast between the crisp leaves with the heavier pizza base.